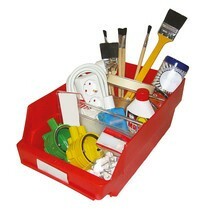 The XXL storage bins are made from eco-friendly polypropylene and ensure organised, well arranged storage of small parts and tools in workshops and other operations. These magnetic pouches provide a quick and simple means of labelling rack bays and metal boxes. The pouches feature a powerful magnetic strip on the rear, which ensures a secure hold to the relevant surface or object. 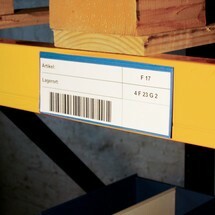 This labelling pouch for stacking frames features a compression-moulded fold, allowing it to be attached to the frame. 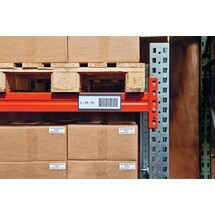 The clamp mounting ensures quick and secure attachment to wooden stacking frames and other transport aids. 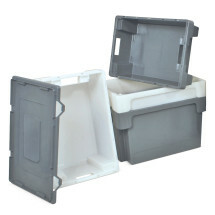 The highly durable storage bins with viewing openings will bring order to your storage space and are ideal for storing small parts both for business and recreational use. 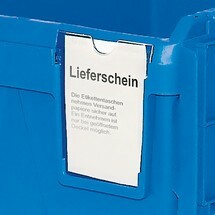 These document pouches provide a flexible means of labelling different warehouse and transport containers, such as pallet cages. The hanging straps on the pouch ensure secure attachment during transport. This set consists of 3 aluminium boxes in varying dimensions for versatile applications. 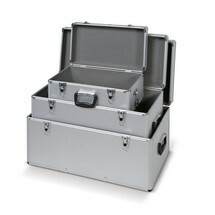 The cases are light, stable and easy to use, making them ideal for all your goods transport needs. Transparency creates transparency. The transparent material of these impact-resistant open-fronted storage bins allows for quick access to the contents and the well organised storage of small parts at the workstation. This document pouch for pallet feet is tailored to the exact dimensions of the central foot on a Euro pallet. It can be applied quickly and easily using a staple gun or self-adhesive tape. 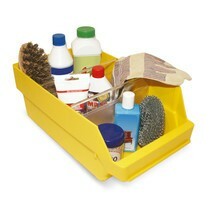 A dividing plate allows you to separate storage bins into smaller segments. This allows you to store small parts such as nuts and bolts separately in the same bin. These labels are ideal for your storage bins. You benefit from a better overview of your materials in production, workshop or dispatch areas. 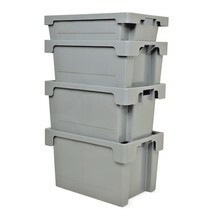 When covered with this lid, stacking containers can be placed one on top of the other for secure, space-saving storage. The smooth, abrasion-resistant surface is very easy to clean. With a cover for your polyethylene (PE) barrel, you can protect the contents against dirt, dust and other external influences. The light polyethylene plastic is food-safe and easy to clean for perfect hygiene. 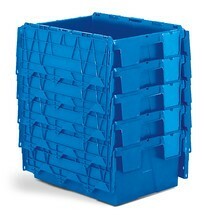 The single-use seals for reusable stacking containers are used to seal the lids on your boxes. 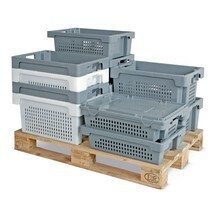 This enables secure transport of merchandise. 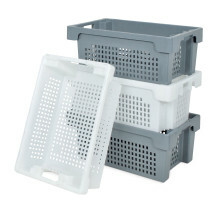 A dividing plate allows you to separate XXL storage bins into individual segments. Small and medium-sized parts can thus be stored separately in the same bin and easily accessed when required.